1. Fully wrapped helmet/head similar to one as seen in Episodes I and II: must include cloth wraps (duck cloth, muslin or similar fabric should be used), leather/simulated leather mouth-wraps, 2 tapered/straight eye-stalks with 2 slits cut into the underside of each, 4 head-spikes, 2 blood-spitters, 1 silver nose-piece (tooth) with at least 2 vertical slots, screened lenses so as not to see the eyes and mouth of the wearer. 2. Fabric robe of similar color, texture, pattern to those seen in Episodes I and II. 3. Fabric neck wrap of similar color, texture, and pattern as ones seen in Episodes I, and II. 3. Fabric waist wrap of similar color, texture, and pattern of those seen in Episodes I and II. 5. Cloth arm wraps covering the arms until concealed within robe(s). 7. At least one bandolier of similar type/design as seen in Episodes I and II across the chest/waist. 8. 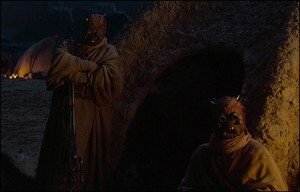 Gaffi stick OR Tusken Rifle either/both of similar type/design as found in Episodes I and II. All elements of this costume MUST BE weathered/tattered to simulate living in a barren, desert environment.